A CBS News poll finds the American public is increasingly convinced that the war in Iraq is going badly and may not get any better. An overwhelming number say Iraq is currently in a civil war, and nearly half think the U.S. effort there will not succeed. These findings come as the Bush Administration prepares to mark the third anniversary of what was supposed to be a quick engagement. On Monday, Mr. Bush asked Americans to show patience amid "images of violence and anger and despair" in Iraq, as he opened a new push to build support for the U.S. effort there. Most Americans don't expect the war to end any time soon. Most think the U.S. will remain in Iraq for at least two more years, and 27 percent say the war will last another five or more years. More than seven in 10 Americans — majorities of both Democrats and Republicans — say a civil war is currently going on in Iraq, while another 13 percent think civil war is likely to break out in the near future. Americans cite Iraq as the most important problem facing the U.S. and are more pessimistic than ever about the chances of eventual success there. Just 15 percent say the U.S. is very likely to succeed in Iraq, down from 21 percent in January. Another 36 percent say success is somewhat likely, down from 42 percent in January, and 47 percent say it is either not very or not at all likely that the U.S. will achieve success — up from 35 percent just two months ago. A separate poll finds the negative feelings about the war even extend to Americans with close military ties to Iraq (either serving there themselves or having a family member there). Fifty-eight percent of Americans in the military (or with family members who serve) and 52 percent of those who have served or have family members in Iraq think things there are going badly for the U.S., about the same percentage as other Americans. Just over four in 10 of each group thinks the war is going well. Half of Americans think the government is not giving U.S. troops in Iraq enough resources and military equipment to succeed there. The war continues to affect their views of President Bush, whose approval ratings remain at or near all-time lows, with two-thirds of Americans thinking he paints too rosy a picture of events in Iraq. "The situation in Iraq is still tense," Mr. Bush said in an address at George Washington University, the first in a series of speeches aimed at building support for U.S. goals in Iraq as the third anniversary of the American-led invasion approaches. Though many fear the country may still be on the brink of civil war among rival Muslim sects, Mr. Bush said he was confident that would not happen. 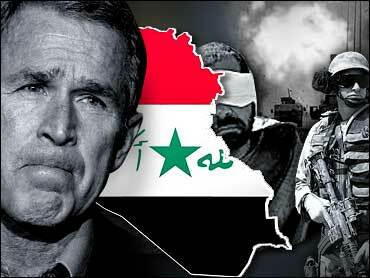 "The Iraqi people made their choice. They looked into the abyss and did not like what they saw," he said. "By their response over the last two weeks, Iraqis have shown the world they want a future of freedom and peace and they will oppose a violent minority."